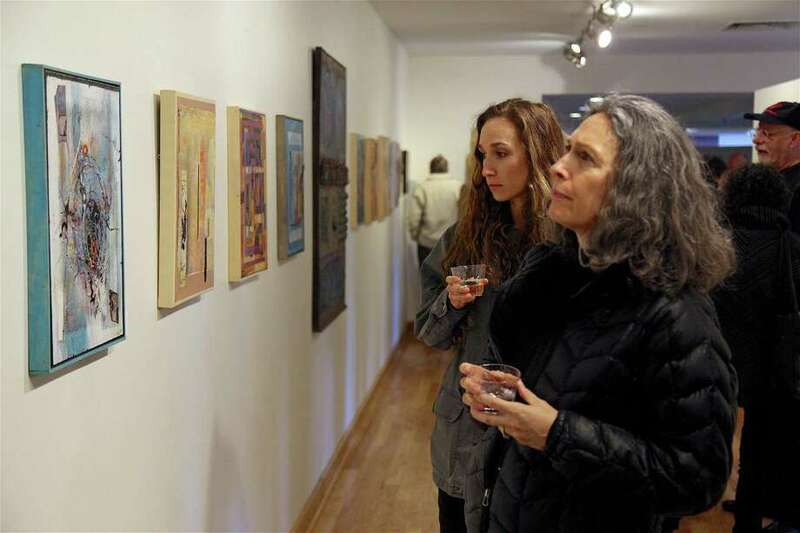 Sara Reszutek and her mother, Lori, of Fairfield, discuss the work at the "Emergence" show's opening reception at Fairfield Library on Saturday, March 16, 2019, in Fairfield, Conn.
“All of the art seemed to be emerging from one thing to another,” said curator Natalie Lucia, of Fairfield, with featured work in various mediums by Kristin Merrill of Easton, Ralph Levesque of Higganum, and William Scully of Boston. Simultaneously, the visual summary pieces relating to a new 13-part jazz composition titled “The Library Suite,” written by Fairfield musician Mark Edinberg, were put on display. While the music will have its premiere at Pequot Library next month featuring visual projections by artist David Pressler, his composition collages are in the gallery as well. “When listening to the music, one gets a feeling for the flow of images that would go with the music,” Pressler said. All the work will be on display through May 5 in the space run by Friends of the Fairfield Library’s gallery committee. “We have several more shows coming this year and we’re already starting to look for 2020,” said gallery manager Liz Tardif.